If you’re searching deep within the interwebs for an Ableton Live mastering tutorial because you want to learn about how to master your own music, you’ve come to the right place. What are the best ways of mastering audio in Ableton Live? This post and tutorial video below have all the answers that you’re looking for. I’m going to explain it using only Ableton native plugins, to show you that you can use these plugins to get a mastered version of your track and you don’t absolutely have to fork out lots of money on third party plugins. If you do use third party plugins, there is a wide range of options available. Also, at the bottom of this post you can enter your details to grab the multiband mastering strip – an audio effect rack that I built for you to use when you master your own tracks. You’ll also get free VIP tutorial videos and access to lots of other sample packs and downloads by signing up. 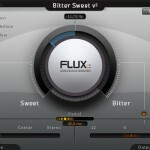 I recommend Fab Filter plugins, Izotope plugins, Waves plugins and Melda plugins as some of the options to look into. I recommend you to loop a busy part of your song to do the mastering work – such as the chorus or the drop, where there is the most energy in the arrangement. When you are mastering your own music, you can bounce out the groups of tracks as .wav files to put into a new project. This is what we call ‘stem mastering’ and it gives you much more control over each group of tracks, or ‘stem’. Some people argue that converting from 48k (when exporting wav files from your original project to use in your mastering project) down to 44.1 kHz (when you export your final mastered project) may cause some issues as the sample rates aren’t in ratio. Therefore you may want to stick with 44.1 kHz at all times when exporting wavs at any stage in the process. If in doubt, test two different versions and judge the audio quality for yourself. Because dithering adds shaped noise (at a barely audible level) which stops the very quiet regions of your track from sounding distorted when at 16 bit or lower bit depth. Dither should only be applied to the very last step in the process to the final .WAV file. Why keep your sub separate from your mid bass stem? Because getting the level of the sub right in comparison with your mid basses, your kick and other elements in your track is one of the hardest things to get right, so keep the sub and mid basses separate so that you can adjust their relative levels at this stage if you need to. Another great advantage of these stems is that you can chop the audio clips up, reverse parts of them and add all kinds of crazy glitches to your stems to create effects that would otherwise be very difficult to create. When you drag and drop all of these stems into separate audio tracks in a new Ableton project from your desktop, you can leave them at 0 dB to start with, because this level will mean that your master channel in this new Ableton project will still be peaking at the same level as it did in your original. Step 3 – Let’s Start Building Your Mastering Chain! We’re going to be splitting the frequency spectrum into 3 different frequency bands, so that we can process each frequency band independently. This gives you much more control over your mastering process and helps you to get a much more dynamic sounding finished piece of music. First, go into your audio effects browser on the left of the screen and take a ‘multiband dynamics’ plugin. Drag and drop this onto your master channel. Next, click on this device’s title bar so that it becomes blue (like in the picture above). 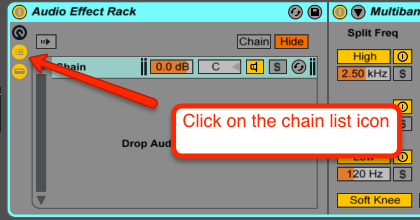 Next, press cmd G (Mac) or Ctrl G (Windows) to put your multiband dynamics into an audio effect rack and click on the ‘chain list’ icon as shown below. Now you see where it says ‘chain’ in blue in the picture above? That chain is one instance of the multiband dynamics plugin. We’re going to click on that and then press ‘cmd D’ (ctrl D on windows) to duplicate that chain twice more, so that we have 3 instances of multiband dynamics in our audio effect rack. We can rename these bands using the command ‘cmd R’. On the instance named ‘low band’, we’re going to solo the low band in the multiband dynamics plugin. On the instance named ‘mid band’, we’re going to solo the mid band in the multiband dynamics plugin. On the instance named ‘high band’, we’re going to solo the high band in the multiband dynamics plugin. Next, we’re going to click on the Macro Mappings icon, so that we can map some parameters of these plugins to different macros in our audio effect rack. To do this, click on map mode so that all the parameters in the audio effect rack become green. If you’ve done this on your mid band and your high band plugins, you can now use Macro 1 to adjust the cross over frequency between your middle band and your high band. Next, repeat this process for your mid and low band plugins, but this time we’re going to map the LOW frequency to macro 2. Next, you can set macro 1 to about 300 Hz and macro 2 to about 3 kHz. Ideally, you would want to have all frequencies from 0 Hz up to about 300 Hz or even 500 Hz to be in mono. Why? Because large speaker systems like the ones you find in nightclubs (where you’ll want your tracks to be played most likely) have a hard time trying to produce these low frequency sounds in stereo. That’s because speaker systems in night clubs generally have huge sub woofers, which are in mono. The cross over frequency that separates sounds played out from the subs from sounds played out by stereo speakers may be around 500 Hz. So any sounds in your track below that frequency can be played in stereo. So how do we make the low frequency band mono? Easy – take a ‘Utility’ from your audio effects menu and drop it onto the end of your ‘low band’ plugin, making sure that it is inside your audio effect rack. Next, adjust the Width setting in your Utility plugin to 0%. Conversely, you may want to add a little extra width to the high band. 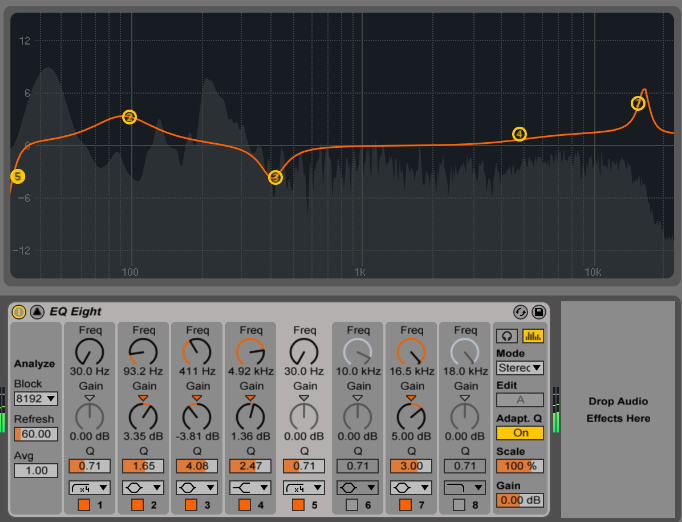 You can drop a Utility onto the end of the high band multiband dynamics plugin and increase the width. To get a sense of what this is doing to your upper frequencies, you can turn off the mid and low bands temporarily while you listen to the high band as you change the width in the Utility plugin. You probably wouldn’t want to go higher than 115% or 120% but it depends on how wide your sounds are in this area to begin with. You song may not need this at all. It also depends on your tastes. One reason why we do mastering to our tracks is to make them sound louder and more energetic, so that they will stand up to other tracks in the same or similar genre, when our tracks get played by DJs for example. In mastering there is a big debate about the ‘loudness wars’ – many people think that producers and mastering engineers focus too much on trying to make their music sound as ‘loud’ as possible, which means adding lots of compression and limiting to it. The reason why many people don’t like this style of mastering is that it reduces the dynamic range of the sounds in your music, making it sound flat, dull and lifeless. So what is dynamic range? Dynamic Range is the ratio between the largest and smallest possible values of of volume or ‘level’. When we heavily compress or limit a sound, we reduce its dynamic range. Here is an example of a track by Knife Party that has had heavy limiting applied to it in the mastering stage. See how flat the sound wave looks. If you listen to it, you can tell that it sounds loud, but the dynamic range sounds relatively small compared with other songs. The choice is yours… Personally I try to make my tracks sound as loud as other tracks in that genre, while also trying not to go too crazy with the limiting and compression. In step 5 of this tutorial, we will want to thicken up the sounds using some compression. The low band will have the heaviest compression to thicken it up the most, and its dynamic range will be reduced more than the mid and high bands. Because the low band frequencies are the ones that provide the most energy to the track, and our ears like to hear a consistent volume level. We find it easier to dance to and to let our minds go with the flow of the song when the dynamic range of the low band is nice and tight. To achieve this, we will place a compressor plugin on the end of the low band chain, after the Utility (width 0%) and inside the audio effect rack. Make up gain: If you’re confident about your listening skills, you can adjust the make up gain manually to a similar output level to before you applied the compression (this is difficult to get right). Alternatively, you can leave the make up activated. For all three compressors, you will probably want to use Peak mode, so that the compressor reacts to the peaks in level, as opposed to RMS mode, where it reacts more slowly and is less sensitive to peaks. It really depends on your genre, your tastes and the quality of your mixdown. For the mid band, we will apply some gentle compression, but it will be weaker than the compression we applied to the low band. For the high band, you may want to apply ever gentler compression, or consider having no compression at all on the high band. It is up to you. Mastering requires lots and lots of practice and training your ear. This is where we further reduce the sudden peaks that occur in the track. We’re not yet looking to beef up the overall level of our track at this stage – we just want to further reduce its dynamic range to make it smoother in terms of level changes over time. 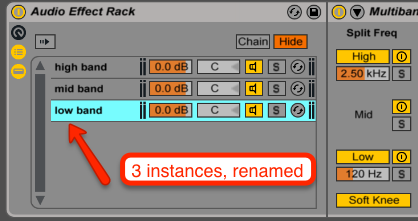 First, drag and drop a limiter onto the end of each band in your audio effect rack. Next, solo the low band. 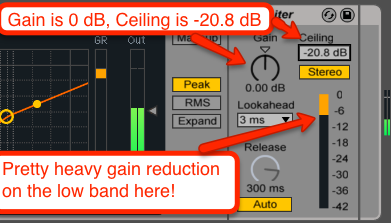 By default, the ceiling of the limiter in Ableton Live is set to -0.3 dB.We’re going to carefully reduce this ceiling level, leaving the gain level at zero. We’re finished with the multiband audio effect rack for now. The next step is to drag and drop an EQ Eight onto your master channel, after the audio effect rack. You can use this to take out any unpleasant frequencies if they are there, but it is much better if you have done this in the mixdown stage in the previous project before you exported your stems. Ideally, at around 30 Hz you would want a brick wall limiter to completely take out any frequencies below 30 Hz. Ableton’s EQ Eight doesn’t feature a brick wall limiter, so we will go with a 4x low cut. You can add another pole to the same frequency of about 30 Hz and make that a 4x low cut too, so you’re basically getting a 16x low cut, which is close to being a brick wall. Do this only if you think your track needs some extra low end energy in the kick and sub. Do this to take out some muddy frequencies – human ears don’t like sounds in these frequencies usually. To make your track subtly sound a lot brighter, without going crazy on the overall brightness, create a pole at 16.5 kHz and boost by 4 or 5 dB, with a high Q level, around 3. This works wonders for me and I do it in nearly every track I master. Drop a limiter after the EQ Eight unit.We will keep the ceiling at its default -0.3 dB. We’re going to use this limiter as a maximizer, to increase the overall volume of our track. What we’re going to do is increase the gain of the limiter until we start seeing some gain reduction taking place. We want no more than 6 dB of gain reduction in this limiter. Once you’ve done this, your mastering will be done and all you need to do is spend some time to tweak all the settings. I recommend you to A/B regularly as you test the changes you are making to each parameter. Also, listen to the song at different volume levels, so that you ears don’t get used to one level. Listen at very quiet levels and medium levels. At louder levels, things will sound better, but don’t do this. You need to make sure it all sounds good at the quieter levels. These sample rate and bit depth settings are what CDs use and what MP3s will use anyway, so there is no point in exporting at this stage in a higher bit depth or sample rate. Thank you for reading this far, and if you found this useful or if you have any other tips, please leave a comment below and tell me what you thought! 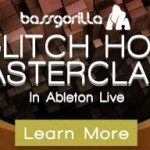 Then check out our comprehensive course on Mixing And Mastering In Ableton Live.